Kalakand | Can't Believe It's Allergy Free! Almost all Indian sweets contain a variety of nuts. Even ostensibly nut free mithai such as milk cakes or pedhas are made in parallel with other, nut rich preparations. The risk of cross contamination must be factored in. 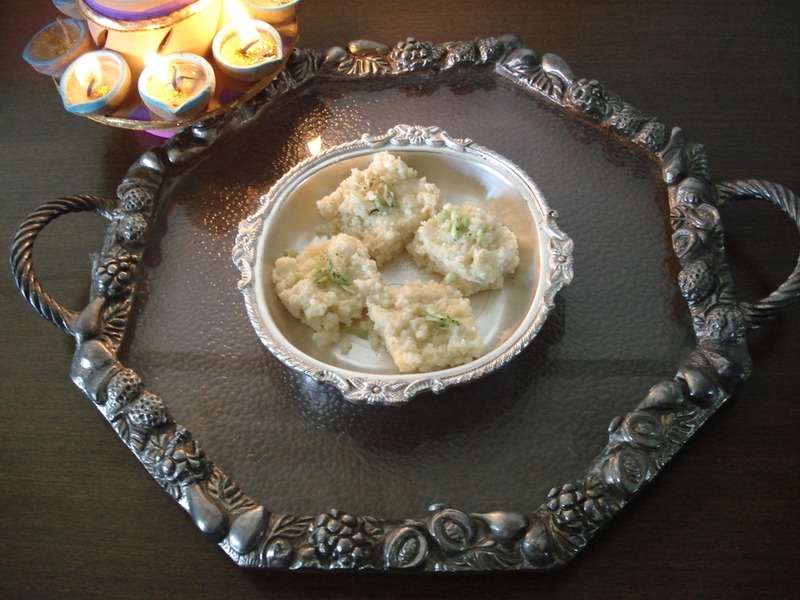 It is so much safer to make special occasion mithai at home. You need just about 15 minutes to make this yummy kalakand for all the family—and it is all the more delicious as it is so much more fresh than anything that has been on store shelves. A drop of green food color. If you are using saffron, crush strands in a small bowl and add a teaspoon of hot water, to strengthen color. Set aside. Cook till mixture thickens into a lump. Remove pan /wok from heat and spoon the cooked mixture into a plate, about 6” in diameter. Flatten mixture with a spatula or with the back of a large spoon. Thinly slice pumpkin seeds and color them with the drop of green food color. Allow the kalakand to cool, then make square pieces. Gently lift pieces onto your serving platter, or place in a container and refrigerate for later use. Use colored pumpkin seeds when not using saffron, or just make it colorful if you like.